Plastic version. The Desire 500 has a 4.3-inch display, just like the HTC One Mini. However, both devices could not be more different. The mainstream device has a quad-core SoC, expandable storage, a plastic case and is also significantly cheaper than the One Mini. An interesting alternative to HTC's metal smartphone? The recently launched Moto G has created a new pricing structure with quality and full featured handsets available for around a third the price of the competition. 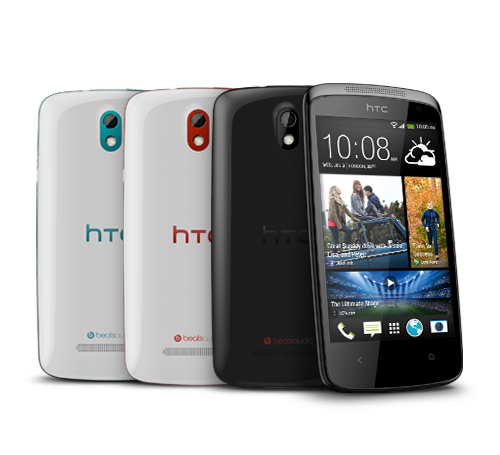 In the past I have often asked to review HTC devices as they looked smart and had little extra bits of quality. My name never seemed to come to the top of the list, with this unit however I was offered it I did not even have to ask. The HTC Desire 500 is a great-looking device, with tons of unique software and solid mid-range smartphone specs on board. It's hard to find any real weaknesses with the phone, including its reasonable £199 price tag. To sum up, it's simply a very good mid-range Android smartphone. The HTC Desire 500 is a solid, affordable phone. It offers businesses a £199 quad-core Android experience and boasts a reasonably decent rear camera. But being released just weeks before the cheaper and higher-specced Motorola Moto G – which runs using a more recent version of Android, has a better screen and even more powerful Snapdragon 600 processor – the Desire 500's long-term appeal is questionable. Who's going to buy the HTC Desire 500? Well, we're not entirely sure. If you love the software on the HTC One, but don't have wide enough pockets then it could be for you. But, if you're solely focused on price, the Motorola Moto G is a clean Android and cheaper, while for around £80 more you can get a Nexus 5 with an amazing spec sheet and 4 times the internal storage, plus LTE. The HTC Desire 500 is a very good phone that's perfect for light, relatively undemanding users who don't want to put up with the very cheapest phones around. But enthusiasts looking for a good deal are better off looking at the Nexus 5, which offers a lot more for not that much more money. Qualcomm Adreno 203: Entry level GPU with support for OpenGL ES 2.0 These graphics cards are not suited for Windows 3D games. Office and Internet surfing however is possible. » Further information can be found in our Comparison of Mobile Graphics Cards and the corresponding Benchmark List. 200 8225Q: Quad-Core Cortex-A5 entry level SoC» Further information can be found in our Comparison of Mobile Processsors. 78.91%: This rating is not convincing. The laptop is evaluated below average, this is not really a recommendation for purchase.